Monday: because we ran out of time Friday building our rubberband cars, I allowed the kids to finish building at home and we raced them in the morning. The pictured car easily ran the minimum 3 meter distance required of the project. 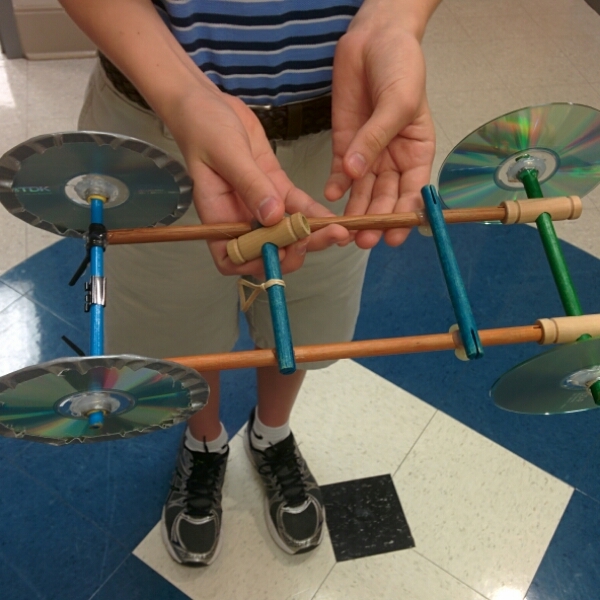 Also this student had an ingenious way to create a spinning axle that’s held in place. He said this car was his fourth iteration. My feeling on this project is that it’s probably best to have kids build an published design and modify it. In the ninth grade the average kid simply don’t have the mechanical aptitude to design and build in a reasonable window of time.